Sopapilla reminds me of when I was growing up in Southern California. One of my childhood best friend is Mexican and his mom who grew up in New Mexico made us treats from time to time. My favorite is her sopapillas, which is more or less a form of fried dough slathered with honey. 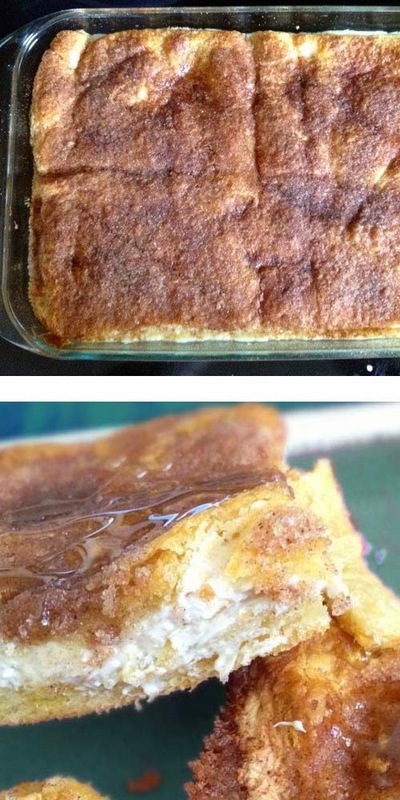 It goes without saying that the sopapilla cheesecake recipe below is nothing close to what she made. It's just that the word "sopapilla" evokes fun memories. With a hand or stand mixer, cream together cream cheese, sour cream, egg, vanilla and 1 cup sugar. Set aside. In a small bowl, mix together 1 cup sugar and cinnamon. Set aside. In a greased 9x13 baking dish, lay out 1 can of crescent roll dough as the bottom crust. Be sure to push together any seams to seal cracks. You should also consider using full sheets of crescent roll doughs if available. They're easier to work with. Spread cream filling evenly over the dough. Cover the filling using dough from the second can of crescent roll while sealing seams as best you can. Melt butter in a cup and pour on top as evenly as possible. Then pour and spread sugar/cinnamon mixture to cover. It should look messy with puddles of butter and sugar blobs, but it will work out in the end. Now, when serving you could optionally drizzle the cheesecake bars with honey if the sugar and cinnamon mix is not sweet enough. I understand using honey if served the traditional way (or at least, my friend's mom's way). Here's a quick video to help with the general direction. Just note that the ingredients for the two sopapilla cheesecake recipes are slightly different. The video ingredients are simpler, but it should also be a good one. And the author also cut and serve her sopapilla cheesecake into square bars.